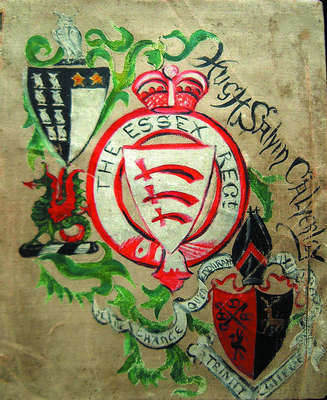 This scrapbook contains memorabilia from Hugh Calverley's (and his family's) experiences during World War I. As a young man, Hugh joined the Signal Corps, both his training and battlefield experiences being described. "The scrapbook is a handmade affair with odd pages, odd paper, bits of canvas sewn and glued together. The collection of memorabilia is not chronological but happily stuck and stitched in a most fascinating manner. Once can almost feel the mother devoting love and hours to create what could be the final chapter of the life of her first born son. She was no stranger to war."